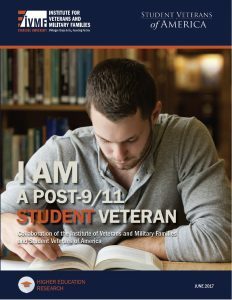 In a collaborative effort between the Student Veterans of America and the Institute for Veterans and Military Families at Syracuse University, the following documents aim to spark a new discourse on how our colleges and universities view and empower student veterans, a discourse that pushes higher education past the “veteran friendly” rhetoric to seize the long-term value of veteran students and alumni, and one that actualizes the intended promise of the Post-9/11 GI Bill not only for our veterans, but for all Americans. 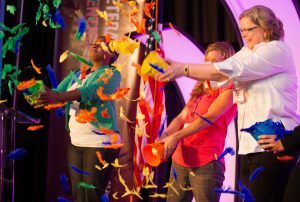 This unique essay provides insight into the lives of veterans in higher education – from the voice of a student veteran. 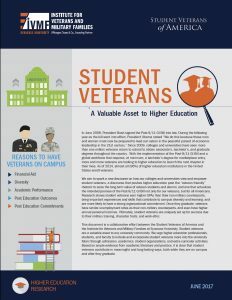 This infographic provides key information and statistics supporting the case for veterans on campus.